How can you not love a cookbook that devotes an entire chapter to dumplings, another to gravies and, quite rightly, prioritizes cakes and candies at the front? 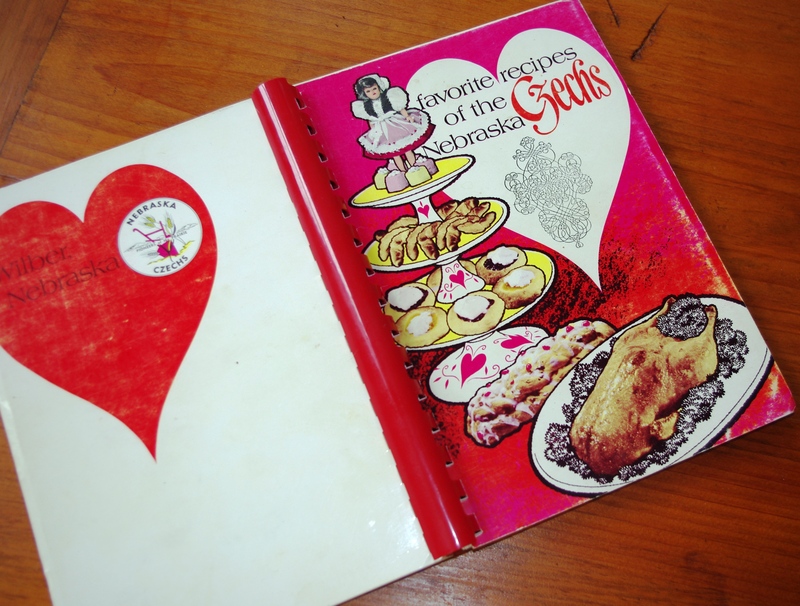 That it also serves as a historical record of my people, home state and the decade in which it was produced makes Favorite Recipes of the Nebraska Czechs all the more endearing to me. I bought my copy (in its eighth printing, 1986) to expand my recipe index for koláčes (kolaches), the hallmark pastry of southeastern Nebraska—home to the Czech Capital of America, in Wilbur—and the standard by which bakers there are judged. I have my grandmother’s dough recipe (perfect! ); it was new and interesting koláče fillings I was seeking. Assumption of knowledge aside, this book is a treasury of foods from the old country—houska, an intricate braided yeast bread redolent with spices; poppy seed cakes; doughnuts of various stripes; plus a multitude of ways to use sauerkraut. Of course, reflecting time, place and culture, it also has plenty of dishes the involve beef tongue, round steak, Jell-O, cottage cheese and cabbage—though, thankfully, not all at once. So, I committed to making something on this page, and a deal’s a deal. I gritted my teeth, pulled out the meat hammer and opted for Stroganoff Supreme over the Beef Parmigiana. If I were going to do this, at least it should seem Slavic. The stroganoff, like most of the recipes in the book, was simple. After I hammered the round steak and cut it into strips, I browned the meat in butter (NOT margarine, sorry ancestors). After that, I tossed in chopped onions, canned sliced button mushrooms, salt, pepper and dry mustard. After a quick sauté came the pièce de résistance: CREAM CHEESE! A whole block of it, plus enough milk to thin the sauce. Once the cheese melts, you spoon the stroganoff over hot buttered egg noodles tossed with fresh parsley. All in all? Not bad. It’s certainly something that could serve as inspiration for future winter dishes. Say, with a different cut of meat, fresh mushrooms, more mustard and lots of garlic. But you can’t beat cream cheese and buttered noodles. Your Czech cooking and related ingredient list (did you guys eat cottage cheese and noodles growing up, too?) reminds me of the time my NYC roommate came home and I had been making cabbage and noodles, the comfort food rather than the bane of my childhood ethnic meals. She opened the door, smelled the air, and I prepared for the worst. This was less than cool (and it was Williamsburg after all), this was also smelly. I forgot the key fact, however: She was Russian and she was homesick. We ate several servings and skipped the bars that night. We ate a lot of cottage cheese, but not with noodles as my father (despite his background) does not consider noodles to be food. Rather we had a whole lot of boiled potatoes and mushroom gravy, the food of his childhood. Nasty. We begged for pasta. And chicken. But had round steak, fried, a LOT. Oh, and hamburger gravy, also on boiled (not even mashed!) potatoes. Bleeech. Bane of my childhood: cube steak. But a whole block of cream cheese? Yikes. And the results are none too pretty, sorry to say. Mmmmmmmm…… block of cheeeeeeese…. Less than goes in cheesecake! And how about the book cover 🙂 There are kolaches on there… and houska. And possibly a rabbit or chicken, in the front.